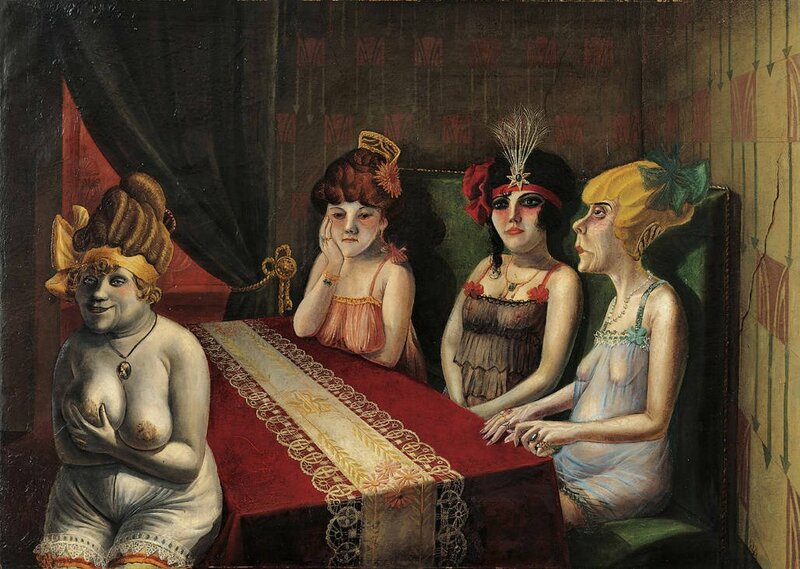 My featured artist today is the German painter and printmaker Otto Dix. Dix was born in December 1891 in Untermhaus, Germany, which is now a part of the city of Gera. He was the eldest son of Franz Dix, an iron foundry worker and Louise Dix, who was a seamstress and amateur artist. His mother had also written poetry in her youth. Otto had a cousin, Fritz Amann, who was a portrait and genre painter and so, from an early age, Otto Dix was exposed to the world of art. At the age of fifteen Dix started a four year apprenticeship with the landscape painter Carl Senff and it was whilst at Senff’s workshop that Dix started painting his first landscapes. At the end of his apprenticeship in 1910 he enrolled at the Dresden School of Arts and Crafts and supported himself financially by painting portraits and selling them to local people. Whilst there he studied under Richard Guhr, the painter and sculptor and Dix attended his figurative and decorative painting classes. 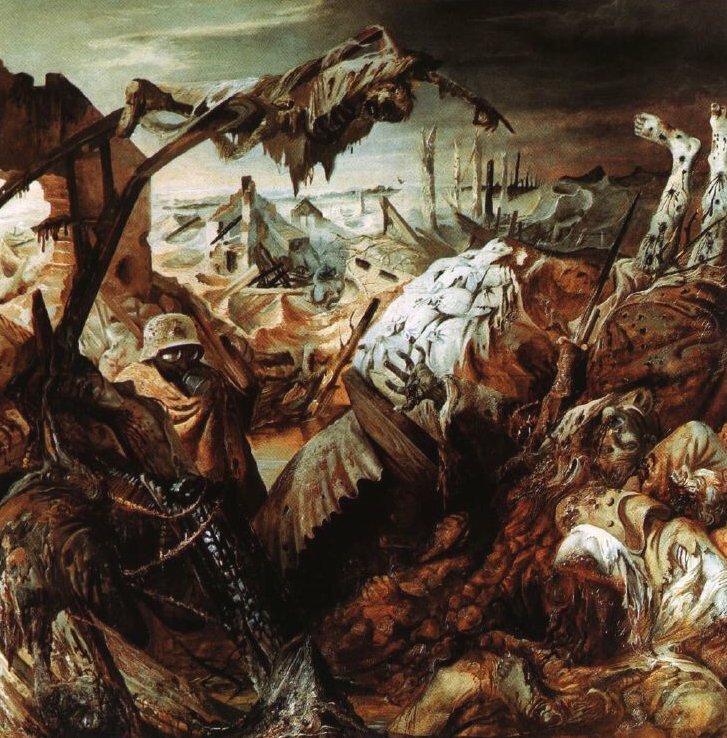 World War I broke out in 1914 and Otto Dix enthusiastically enrolled in the German army. His first assignment, as a non-commissioned officer, was to join up with a field artillery regiment in Dresden. In the autumn of 1915 he was assigned as a non-commissioned officer of a machine-gun unit in the Western front and took part of the Battle of the Somme. He was seriously wounded on a number of occasions. In 1917, his unit was transferred to the Eastern front where he remained until the end of hostilities with Russia. He then returned with his regiment to the western front and took part in the German Spring offensive. He earned the Iron Cross (second class) for valour and reached the rank of vice-sergeant-major. By the end of the conflict, he had been wounded on five separate occasions. Dix was horrified and very much affected by the horrific sights he had witnessed during the four years of the war and these visions caused him to have many persisting nightmares well after the end of hostilities. It was these nightmares and his traumatic experiences during the fighting that comes through clearly in many of his subsequent works, including a portfolio of fifty etchings called War, published in 1924. At the end of the war, Dix returned to Gera, but in 1919 he moved to Dresden, where he studied at the Dresden Art Academy. It was whilst studying art in that city that he met the Expressionist painter, Conrad Felixmüller, who was one of the youngest members of the New Objectivity movement. Felixmüller was also a member of the Communist Party of Germany and his paintings often dealt with the social realities of Germany’s Weimar Republic. He became a mentor to Otto Dix and managed to bring together Dix and a number of like-minded Expressionist artists to form the city’s most radical art group, the Dresden Secessionist Group. 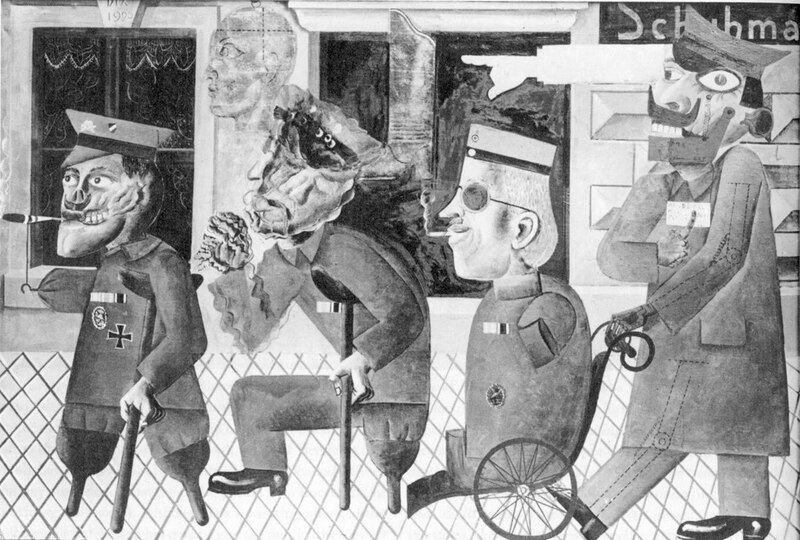 A year later Dix met George Grosz and it was around this time that Dix began to integrate collage aspects into his work. In 1922 Dix moved from Dresden to Dusseldorf where he found a more lucrative market for his works of art. A year later, in 1923 he completed a painting which shocked the public and establishment alike. It had been commissioned by the city of Cologne and was entitled The Trench. It depicted dismembered and decomposed bodies of soldiers after an overnight battle in a German trench. For many, it was a gruesome and offensive depiction of death in the trenches. He began the painting it in 1920 whilst he was living in Dresden but did not complete it until three years later. Such was the uproar that the Wallraf-Richartz Museum in Cologne, which had commissioned the work, had to hide it behind a curtain. The mayor of Cologne at the time and the future German Chancellor, Konrad Adenauer, cancelled the city’s purchase of the work and the Museum director, Hans Secker, was sacked. Otto Dix’s work, like that of his friend and contemporary George Grosz was extremely critical of the present-day German Weimar society. His paintings would draw attention to the more miserable side of life and the hopelessness felt by the ordinary German people following on from their defeat in war. The depictions seen in his paintings often graphically showed prostitution, violence, old age and death. He also focused his attention on the German veterans of the war who would wander the streets of Berlin physically disfigured and mentally unable to cope with life. These were the forgotten men who had served their purpose and who were now abandoned by society. These paintings of his were somewhat sad and depressing and yet realistic. When the Nazis came to power in Germany in the early 1930’s they regarded Dix as a degenerate artist and his depictions of the defeated German soldiers and his portrayal of the low-life of Berlin were considered unpatriotic and for this reason they had him sacked from his post as an art teacher at the Dresden Academy. He later moved to live on the shores of Lake Constance. In 1937, in Munich the Nazis held an art exhibition of what they called Entartete Kunst or Degenerate Art. The purpose of the exhibition was to let the Germans know that some forms and pieces of art were not accepted by the “highest race”, and that this art was “degenerate”. It was often termed Jewish or Bolshevistic art. During the “Entartete Kunst” campaign over 20 thousand works by more than 200 artists of that time were confiscated. Dix’s 1923 painting The Trench and his 1920 work entitled, Kriegskrüppel (War Cripples) were shown at that exhibition. They were later burned. Dix was forced to join the Nazi-controlled Imperial chamber of Fine Arts in order to be able to work as an artist at all and had to promise to paint only landscapes. However, he still painted an occasional allegorical painting that criticized Nazi ideals. In 1939 he was arrested on a trumped-up charge of being involved in a plot against Hitler but was later released. During World War II, Dix was conscripted into the Volkssturm. He was captured by French troops at the end of the war and released in February 1946. Dix eventually returned to Dresden. After the war most of his paintings were religious allegories or depictions of post-war suffering. Otto Dix died in Singen, Germany, in 1969, aged 77. For My Daily Art Display featured painting today I have not chosen one of his gruesome but telling war paintings but a painting which looks at the fall-out from war for individuals, in this case females of the defeated nation. The painting is entitled The Salon I and was completed in 1921, just three years after the end of World War I, Dix had often examined the life of women in the aftermath of war, many of whom desperate for money to feed themselves and their family turned to prostitution. In his painting we see four such women, garishly dressed, sat around a table which is covered with an expensive tablecloth, which evokes middle-class décor. Except for one, they are all passed their prime. These four scantily dressed prostitutes, decked out in bangles, necklaces and other cheap trinkets look bored. They sit there in silent contemplation. In the short term they wonder who their next client will be and how will they be treated. In a longer term they wonder what will eventually happen to them and how was it possible that they have been reduced to this way of life. The female to the left of the painting is overweight and was a character often seen in Dix’s works. She gives us an inviting smile as she supports her breasts giving them an uplift which may make them more tempting to her next client. The woman to the right of the painting is pitilessly depicted by Dix. Her best years are far behind her and no amount of make-up can hide the wrinkles of old age. Her diaphanous negligee does little to hide her sagging breasts. Next to her wearing a red band and bow around her forehead is a young woman. We ask ourselves why somebody with her looks and manner should end up in this brothel. Her eyes and facial expression hide the truth from us. We are left to decide for ourselves what necessitated her to sell her body. Sadly nobody really paid attention to the horrors of the First World War as twenty years later we stumbled blindly into yet another major conflict. Funny (actually no, it’s tragic) how the Germans considered these works unpatriotic and thought that unleashing another horrible war (to kill more Germans) was better for their nation, and indeed patriotic. (The Nazis even executed Remarque’s sister). It’s interesting how Dix moves from a synthetic image, (from The War Cripples of 1920) to a less synthetic picture, in the painting of the trench. Superficially, all of us who studied (a little) art in the 1970’s tend to think that the tendency should be the opposite, but it’s not true.